NITB Approved, Self Catering holiday Accommodation for 4 adults or families with 3 children. A holiday with a difference! Enjoy the simplicity of this newly renovated 200 year old traditional Irish cottage in peaceful surroundings of Tyrone at the foot of the Sperrin Mountains between Omagh and Cookstown. in the area of Creggan. The lovingly renovated Cobblers Cottage has a cosy living area, 2 spacious bedrooms (sleeps 5), a new kitchen, bathroom, barbeque facilities, WIFI available, large garden and a pet friendly enclosure, all while retaining the essence of a traditional Irish country home including the well stocked dresser.. Located at the foot of the scenic Sperrin Mountains, this newly refurbished cottage stands for over 200 years at the heart of the Mid-Ulster area of Creggan (An area of outstanding natural beauty). 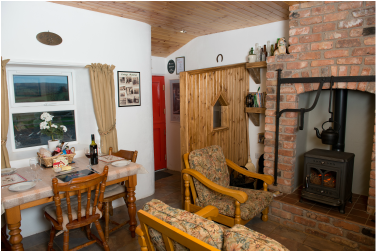 This self catering cottage is a perfect location for relaxing,walking holidays, cycling & mountain bike holidays, golfing, angling, horse riding, Archaeological tours,heritage centres/ancestral homes, leisure activities, activity breaks and exploring the Sperrins. The cottage is a central base in Tyrone for touring the North. Perfect for families with children, escape to the undisturbed beauty of rural life and enjoy the leisurely freedom our cottage has to offer. Pet friendly accommodation - spacious, secure enclosure with kennel close to cottage. In the daytime take in the great outdoors, with the large, picturesque garden and the readily available BBQ, or even bring a picnic and go exploring with our rentable bicycles. Then at night, whether you’re resting in the comfortable bedrooms or snuggling around the authentic fireplace of the quaint living room with family and friends, we’re sure you’ll have a perfectly relaxing stay and your time at the Cobblers Cottage will be an experience to remember. Although you may be happy to enjoy the tranquil separation from the hustle and bustle, the cottage is close to the A505 road and is within close driving distance to local towns Carrickmore (6 miles), Cookstown (11 miles) and Omagh (15 miles); with local attractions like the An Creagan Centre (1.4 miles), Beaghmore Stone Circles (5 miles) and Drum Manor Forest Park (7 miles) also nearby. A visit to the Ulster American Folk Park is very enjoyable day out too. Our guests who are looking for activity have enjoyed a day trip to Todds Leap and Jungle NI which are both 30 minutes drive from the self catering holiday cottage. Local leisure centres in Omagh and Cookstown are ideal standbys on a rainy afternoon. For the more adventurous guest Cmore Flying School, Rallystorm Ireland and Davagh Forest Mountain Bike Trail are well worth a visit and are only 10 minutes drive from Cobblers cottage. Golfing and angling visitors ar well catered for locally. Not forgetting the historical cities of Derry and Armagh, Marble Arch Caves in Fermanagh, the Titanic Belfast, Mourne Mountains,, the Giant’s Causeway and the beaches of Donegal, all of which are around an hour drive away from this central position. We aim to ensure that you will always have a peaceful and memorable stay here at the Cobblers Cottage. Read reviews posted on Trip Advisor and in Visitors Book on Review page of this website for reassurance! The property is at least 200 years old. The name was chosen because it is known that the Mulgrew brothers operated a shoemaking business in the cottage for a long number of years. Paddy and Hugh went to Scotland to purchase good quality leather. Paddy died in 1913 and Hugh died in 1917. These men were Eamon's great, great granduncles. Eamon and his 3 sisters were born in the cottage and lived there until 1959.